515 London Road, Glasgow. G40 1NQ. Tel: 01415518833. This old established hostelry dates back to the year 1860 when a licence was first granted to a gentleman called William Cook to sell porter and spirits. Mr Cook only had this business for a short time and in 1864 the licence was transferred to a Mr David Rennie. Mr Rennie was born and bred in Bridgeton and resided at 119 New Dalmarnock Road, this old howff then had it's first name "David Rennie Wine & Spirit Vaults", Mr Rennie continued a successful business here until 1895 then the licence was transferred to his daughter Margaret Rennie Blackadder, Margaret changed the name above the door to "Blackadders". These old premises were demolished at the end of the 19th century and a new red sandstone building was erected on the same site, the address of the new pub was 57 Canning street, sitting on the corner of Clyde street now Abercromby street. The bar was of a horse shoe shape, there were four little snugs each containing a table and six chairs, the cellars were always stocked with the very best of liquor and one could always purchase: Moet & Chandons Champagne, Roussillon & CO's Epernay, Dubois, Freres & Cagnion's Cognac of 1858, La Rosa 60 year old, Burgundies of 1863, Kirker Greer & CO's old Irish, Talisker 10 year old, Guinness, Meux's, Bass in bottles, Pentland 90s ale on draught, Schweppes mineral water, Ross's dry ginger, Allsopp's lager, and speciality "Blackadders" own blend of Scotch whisky. This old established business stayed in the same family until the early 1920s, a new licence holder then took over called Mr James Wedderburn who renamed the pub "Wedderburns", in the 1950s the pub was known as "The Snapp Bar", in 1981 the name was once again changed to "The Londoner". 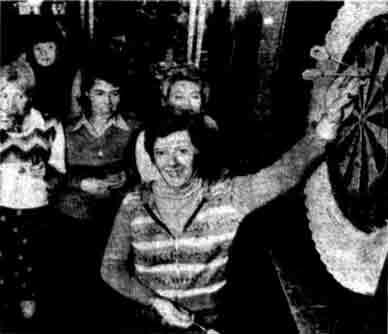 In 1990 the year of Culture Mr Vincent O'Hagan took over the licenceand was run successfully with the help of his wife. 32 Birds of the feathers. Cathie Airlie, captain of the girl's darts team from the Snapp Bar, retrieves her darts during a practice game for tonight's big match. 1976. Darts, like football and drinking pints, used to be a male bastion. But tonight in the plush Grosvenor Hotel, in Glasgow's West End, an event will be held which proves that those days are well and truly over. It is the grand final of the Glasgow's first ever ladies' darts tournament in which 32 queens of the board will compete. See the winners... click here. James Montgomery worked in Blackadder's for 18 years before taking over Uneeda Bar, Duke Street now the Lampost. Mr Montgomery was born in Dalry, Ayrshire and came to Glasgow at an early age. As a youth he worked in St. Enoch Hotel for three years before transferring to the spirit trade in which he gained experience in Rutherglen Road, Eglinton Street and Parkhead before joining the staff at Blackadder's. Montgomery went on to own the Elysian Bar, 290 Buchanan Street assisted by his youngest son James.